Following user requests, the Karlsruhe Nuclide Chart Online (KNCO) has now been updated to provide the literature references for the nuclide chart updates in the various editions. This allows users to trace the literature references used in the nuclide data evaluation process. 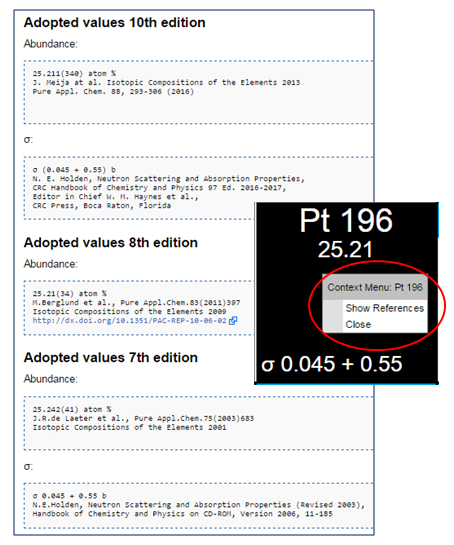 In the example above the references for Pt 196 are shown. From the KNCO, the nuclide Pt 196 is selected. Using the right mouse click, a Show References link leads to the latest references for this nuclide also shown above. The references are subdivided according to the edition (e.g. 10th, 9th, 8th). For each edition the entries are arranged according to Spin and Parity, Half-life, Radiations/Decay Modes, and Cross-sections.